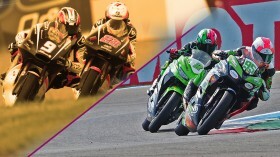 April 2nd, 2017: Carrasco joins 33 other riders on the brand new WorldSSP300 grid, racing for ETG Racing. Eager to impress in a field filled to the brim with young talent, Carrasco shows very early signs of her talent by taking a promising tenth place at MotorLand Aragon. A good result at home that she would improve upon one race later, finishing seventh at TT Assen. September 17th, 2017: Her first year in WorldSSP saw Carrasco learning the ropes and battling fiercely every weekend, but it wasn’t until arriving to the Autodromo Internacional do Algarve that the then 20-year-old found her best form. Putting in her best Superpole performance the day before and starting from third on the grid, Carrasco managed to stay with the leading group all throughout the race. Then at the final turn on the last lap, she took the slipstream at the perfect moment, racing into the lead as the chequered flag came down and becoming the first female rider ever to win a motorcycling world championship race. The first of many groundbreaking moments to come. May 12th, 2018: For 2018, Carrasco moved over to David Salom’s team alongside Dorren Loureiro (DS Junior Team) and found immediate form in the first two races in Spain and the Netherlands, finishing in sixth and fourth position, respectively. But her big break officially came on the Saturday in the third round of this season: after having to fight through Superpole 1, Carrasco dominated the second session, taking her first pole position by nearly a whole second at Imola. May 13th, 2018: That pole was a sign of big things to come. The very next day Carrasco was unstoppable on the Italian track, taking an astonishingly dominant win, and with her closest rivals in the standings unable to follow, Carrasco became the championship leader for the first time in her career, holding a three-point gap over Luca Grunwald (Freudenberg KTM WorldSSP Team). May 27th, 2018: Two weeks later, Carrasco did the unthinkable at Donington Park: pole position (her second), the fastest lap, led every single lap and, most importantly, won her second consecutive WorldSSP300 race. A 3-point lead suddenly became a 22-point lead, with just four races remaining. 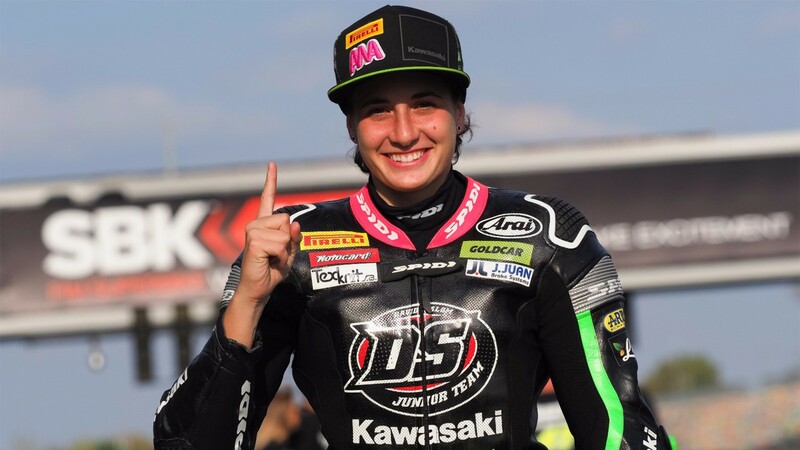 September 30th, 2018: Little over a year after her first race win, Carrasco went one further at Magny-Cours by becoming the first female rider to win a motorcycle racing world championship. Going into the French Round with a 10-point advantage over Scott Deroue (Motoport Kawasaki), the Spaniard put in a calm and composed performance to clinch the title and make history one more time. At just 21 years of age, the sky is the limit for the Champ. Catch all the best moments of Carrasco’s rulebook-breaking season thanks to WorldSBK VideoPass, and celebrate her epic triumph on social media with the hashtags #UnstoppableAna and #PinkWarrior.